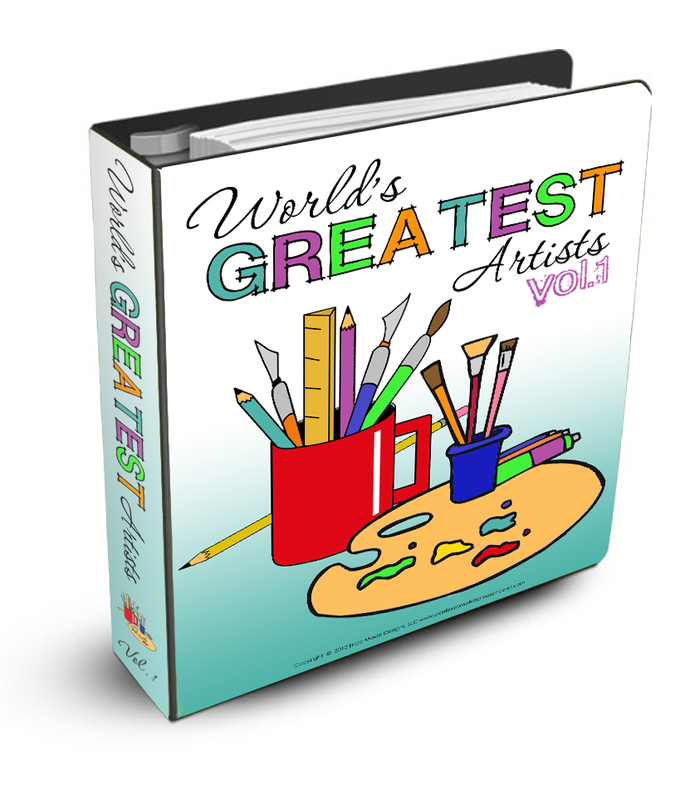 Welcome to our World’s Greatest Artist Study! 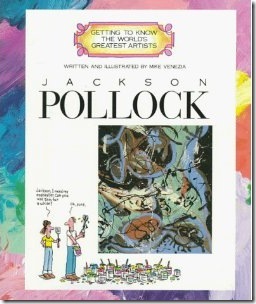 This month we’re focusing on Jackson Pollock. I think so far, this style of “Action Painting” has by far been a favorite of the kids. Jackson Pollock was born in Cody, Wyoming in 1912. He was an influential American painter and a major contributor to the abstract expressionist movement. He began to study painting in 1929 at the Art Students’ League in New York. 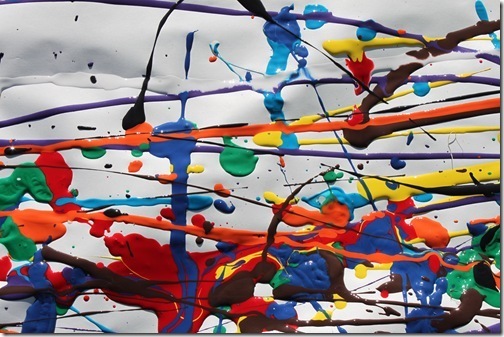 While he experimented with several different styles of painting, he is most well known for “action painting” . 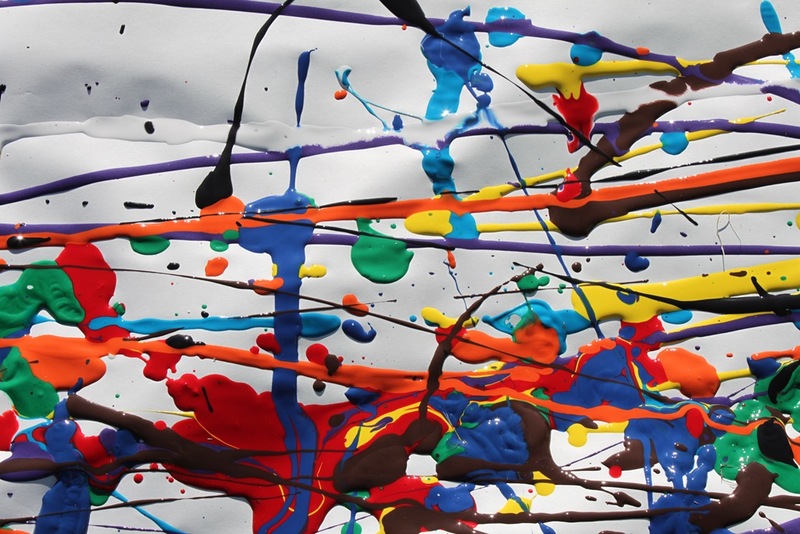 Instead of painting on an easel, Pollock taped his canvas to the floor then would stand above his canvas and literally drip and splash paint from a can onto the canvas. Though he was subject to much criticism, by the 1960’s he was recognized as the most important figure in the most important movement of this century of American painting. No. 5, 1948 is currently the most expensive painting ever sold for approximately $150.6 million adjusted US dollars. 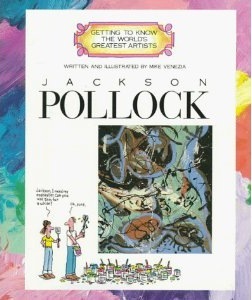 Visit Jackson Pollock.com for more information and artwork. 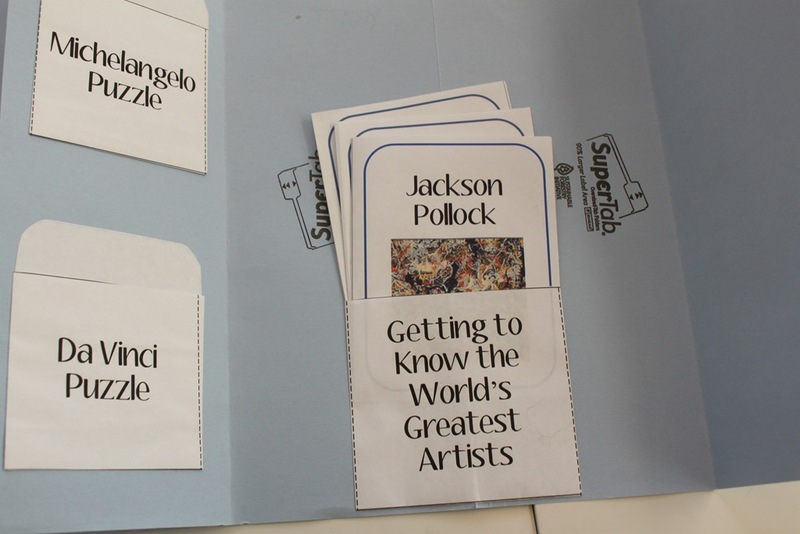 We took a few lessons and discussions to read through the Jackson Pollock World’s Greatest Artist series by Mike Venezia. 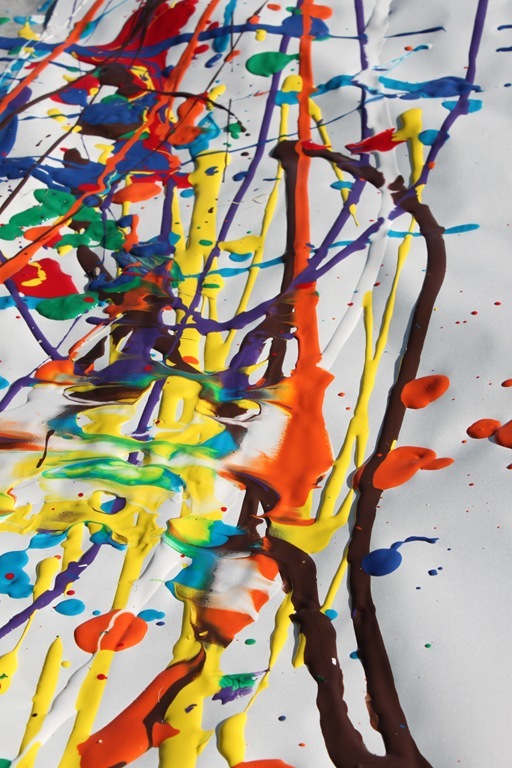 We talked about all the different styles that Pollock was known for, and took lots of time to familiarize ourselves with and critically assess his works of art. 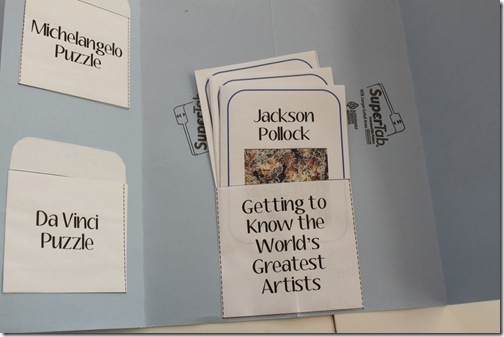 After going over all of Jackson Pollock’s works in the book, we put the paintings into the mini-book, then added our mini-book to our World’s Greatest Artists lap book. 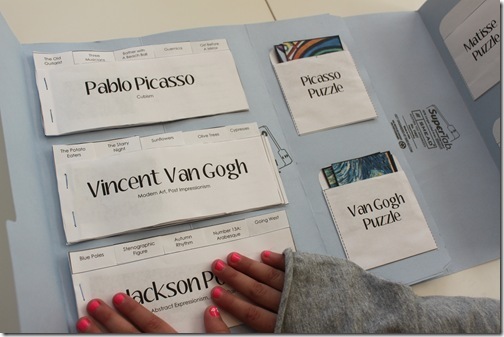 We also filled in our artist flashcard and added that to our lap book. I used my Xyron 900 along with Magnetic Laminate to make it into a magnetic puzzle. 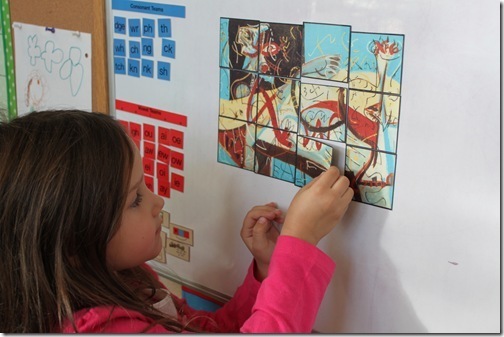 Each of the kids took a turn at the Pollock puzzle included in the curriculum download. This one was actually kind of hard! 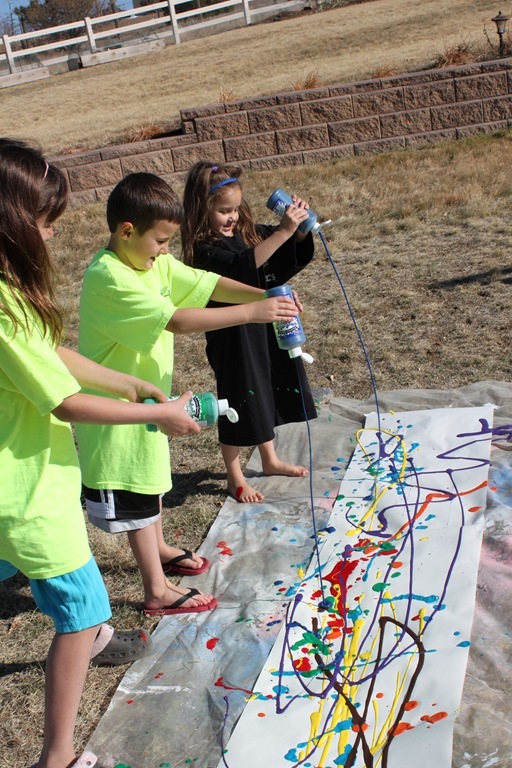 Finally we went outside and took our shot at “action painting”. I have a big crate of tempera paints from Lakeshore Learning that we use for our projects. 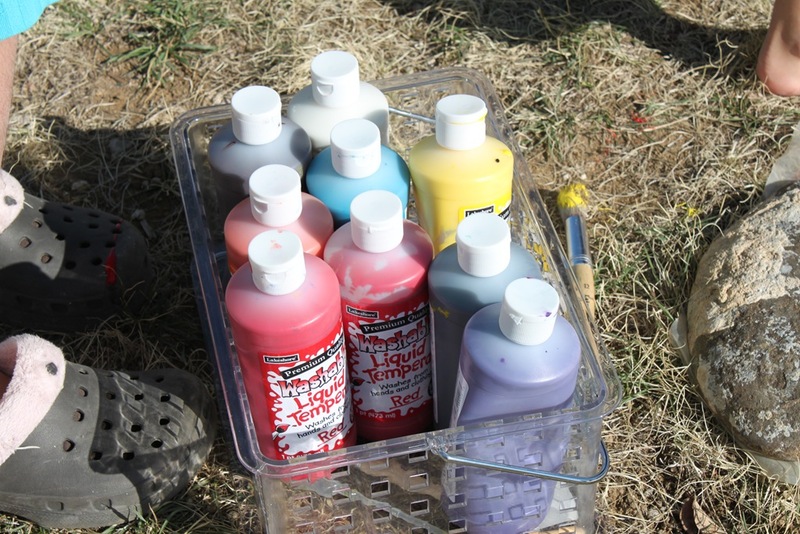 The kids managed to use up quite a bit of it for this activity, so you might want to plan for that as well. I highly recommend doing this outside, and I put large t-shirts on all the kids to protect their clothes. 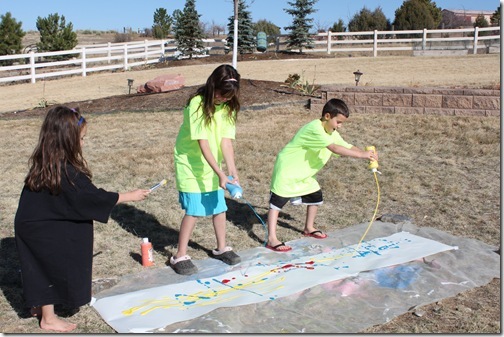 Don’t worry honey, I covered our lawn with some plastic so no grass was harmed during this activity! I did instruct the kids not to just dump a bunch of paint on the canvas, but to actually try to show their movement in the strokes. I think they did quite a good job, and the finished product was really cool! If you’re not quite up to this large project, you can get the same effect on a smaller scale by using shoelaces dipped in paint and dragging them along a normal sized sheet of paper. Click here to see the other World’s Greatest Artists that we’ve covered so far! Great activity! Getting messy is half the fun right? One particularly nice thing is to see the depth you are engaging in the arts… something unfortunately all too neglected in typical school environments. Hi Erica! 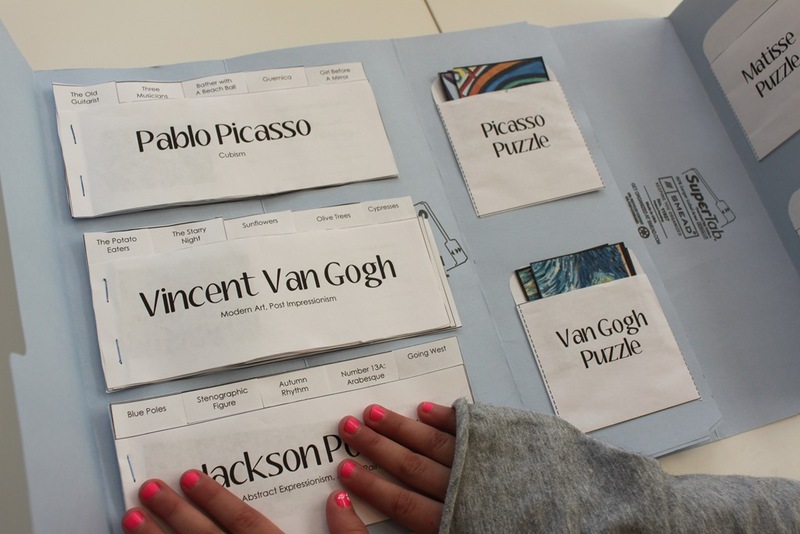 I am looking for an art curriculum for my 7 year old (I also have a 4 year old). THis looks awesome but do my kids need to be a bit older? Thanks for all that you do! We have used many of your printables for our preschooler and he loves them! We are excited about using Raodtrip USA this coming year! Absolutely NOT! My kids are 8,7,5, and 3 and they love this! The books are super kid friendly, and they all like to do the projects! Great activity! And so much fun. @Amy- IMO I don’t think the kiddos need to be a bit older. 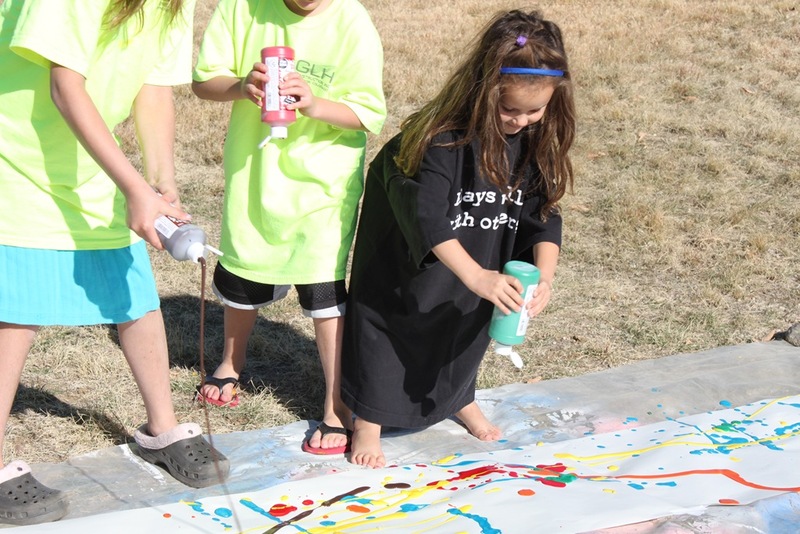 I did this activity with a bunch of preschoolers and what helped me was taping a huge piece of butcher paper to a fence and they splattered the paint onto it with their paintbrushes. I think any aged kiddo would love and be capable of doing that. What fun!! I am so thankful I found your website. 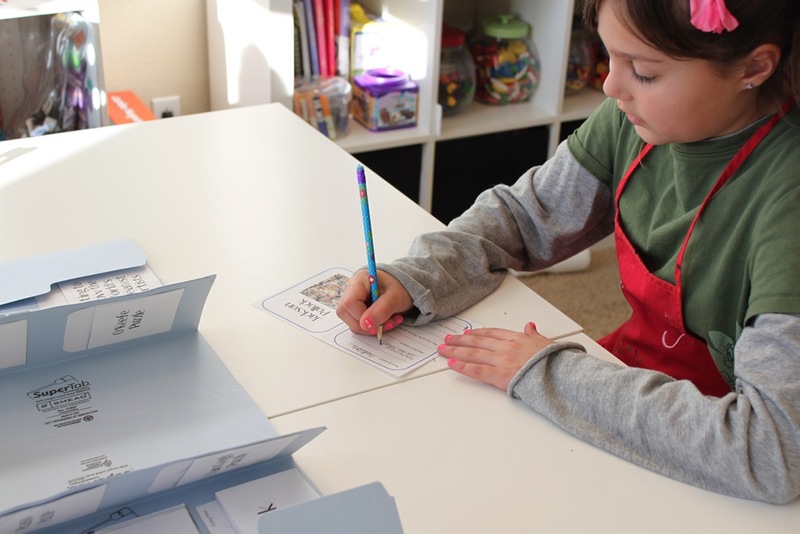 I am working with a 2nd, 1st, pre-schooler, and 2-5 toddlers each day of the week (I homeschool). Your ideas help me not have to think. Don’t get me wrong….I really want to think this up on my own. But it is so nice for God’s grace to come in the form of this blog, at a time when I don’t have time to think for myself. God bless your work and keep it up! It is so useful, helpful, and appreciated! Wow! It looks that your kids are having so much fun! I know my kids also have fun! Thanks for sharing. Art is so much fun! We are in the midst on your Pollock study as well. We did our grand scale “spatter” piece yesterday – thanks to the 60 degree warm front that come thru. My kids are 6, 4 and 2. We have thoroughly enjoyed your study thus far. Thank you for making it available.